From the horse ranch I was brought to the town centre of Plettenberg Bay, where my host showed me around the town and the nature reserve of Robberg. The day ended eating fish that was caught by three other Dutchies, right from the grill. Lovely place this is! After waking up in the dorm of the Southern Comfort horse ranch at 7.30am I soon found out that the weather wouldn't allow me to have the horse riding experience today. It was showering as far as we could see and going on a horse would be as dangerous for the horse as for me, because the trail through the forest would be muddy and slippery. After a cereal breakfast Margriet arranged me a lift to Plettenberg Bay later this morning, as a farmer was heading for this town soon. Margriet said that it would be boring to hang around here while nothing was really happening. It was just a pity about the weather again, but I can't always be lucky. Around 11 I took off in the pickup trick of the farmer and I said goodbye to Glin and Margriet and thanked them for the pleasant stay. Those people are very warm-hearted, I must say. 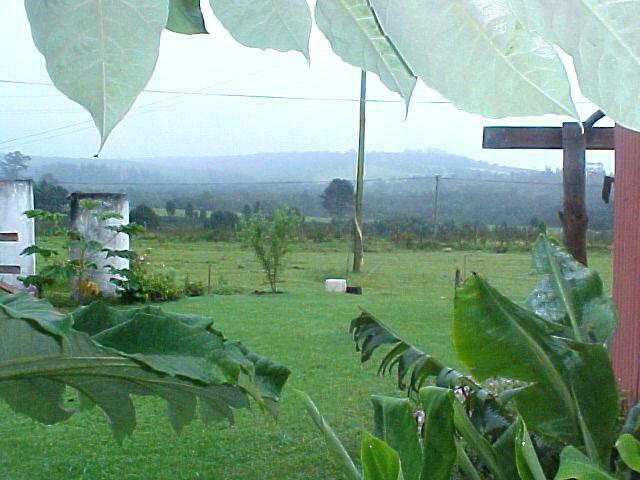 It was about noon when the farmer dropped me off at my next stop: the Albergo for Backpackers lodge in the town centre of Plettenberg Bay. 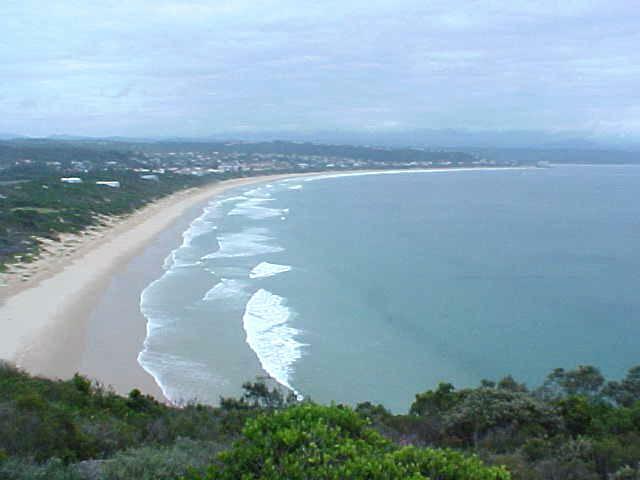 Plettenberg Bay is also known the jewel of The Garden Route. It's more than a village, less than a town. Plettenberg Bay is tranquil and charming, hospitable and rather special. Certainly at first sight! The Albergo Backpackers is a very relaxing place and I could even smell the sea eventhough it was raining. I met up with the two Dutch owners Leslie and Mirjam. They had invited me after getting a tip from the local Ocean Blue Adventures who offered me a complimentary whale and dolphin trip on the sea, and thought "Why not invite this guy, it might be good publicity." After I got a tour around the lodge, where there was a little restaurant area with a pool table and two buildings with double rooms and dorms, we ended up on one of the balconies overlooking the bay. I could see as far from the mountains in the north, with the beautiful green lagoon in the middle and white beaches flank the ocean with its high waves. Today's weather won't allow a dolphin trip either, so I was offered to stay another day at the Albergo, which I thankfully accepted. 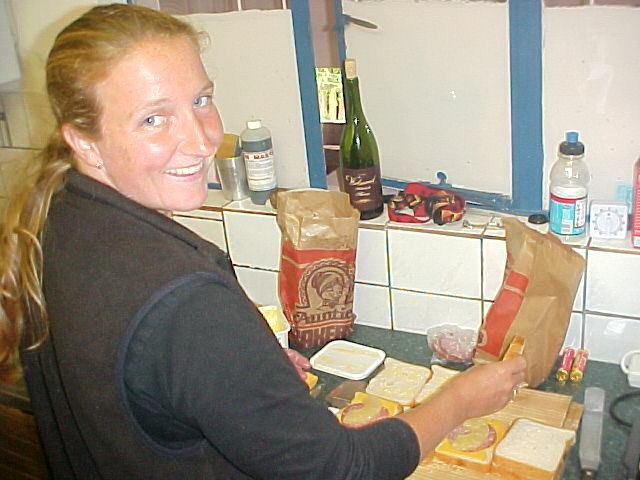 Leslie and Mirjam kind of share the same story as the two owners of the Overlanders Lodge in Knysna. They had both travelled a lot and just loved South Africa. 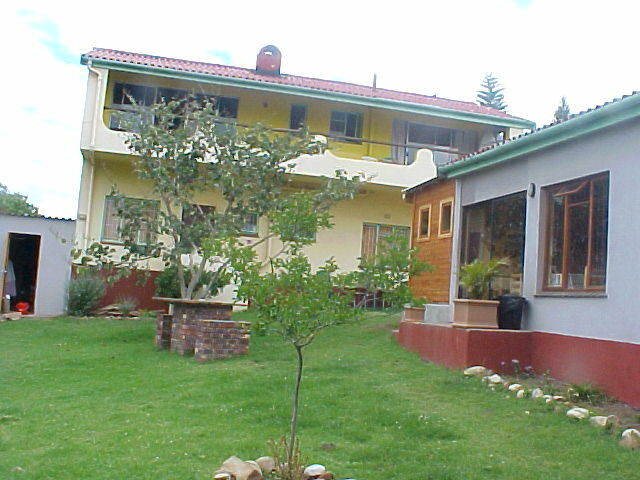 For a long time they were in doubt to take over an existing lodge in Cape Town, until they met up with the previous owner of the Albergo and after a long time of seious preparations they bought the entire place. 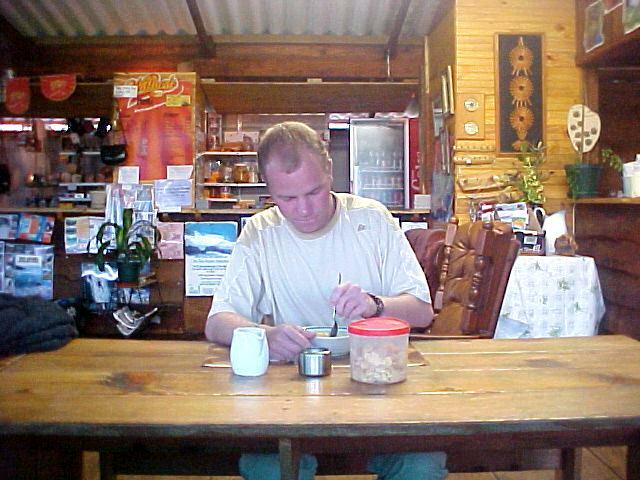 They did some serious rebuilding to offer a bit more comfort for the young travelling backpackers. And it could have been a good choice to settle in Plett as the city was expanding. And normally this place would hide some 30,000 citizens, but in the full summer time over 200,000 people suddenly visit this beach town. Leslie and Mirjam are pretty happy here. "Okay, it still can be a hard job, but we like to do it." Before coming to South Africa Mirjam was an administrator at a Dutch bank and Leslie worked with computers all day. Coming to South Africa did mean a big change, but a very positive one, because they both love the reclined atmosphere of South Africa. You can call it my third day in Plettenberg Bay, but it doesn't feel so for me. It was the first time that I was in the town itself and looking at all the possibillities here I could stay here for as long as thinkable. 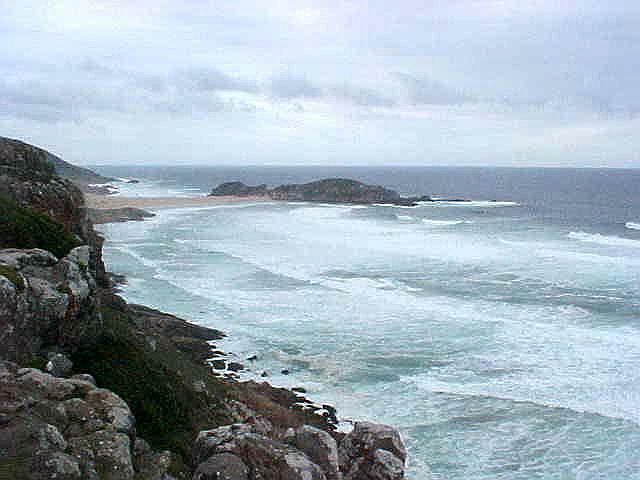 If you like hiking, you could walk the 9 kilometres on the beautiful Robberg Peninsula or go for a coastal trail. 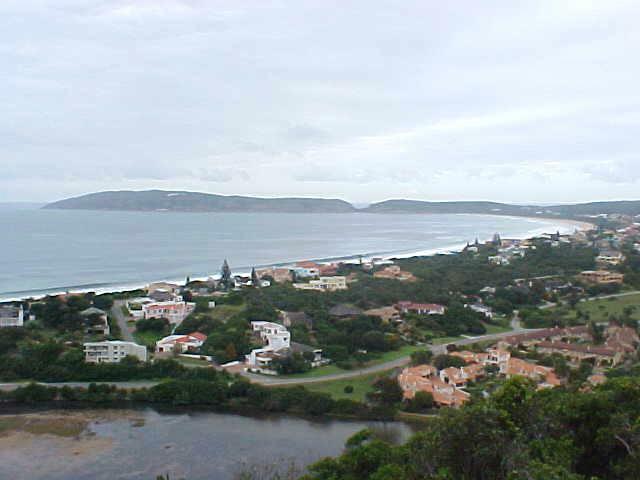 The nearby Keurboom (the next town) area is a good place to paddle on a canoe (not for me anymore...), the waves are great for sufers and body boarders and cruises depart daily for a whale and dolhin trip. And I was already happy that I could stay here an extra day and do some of these options while I was here. I certainly was going to try the beach, so tomorrow defenitely has to be a sunny day. Oh please. 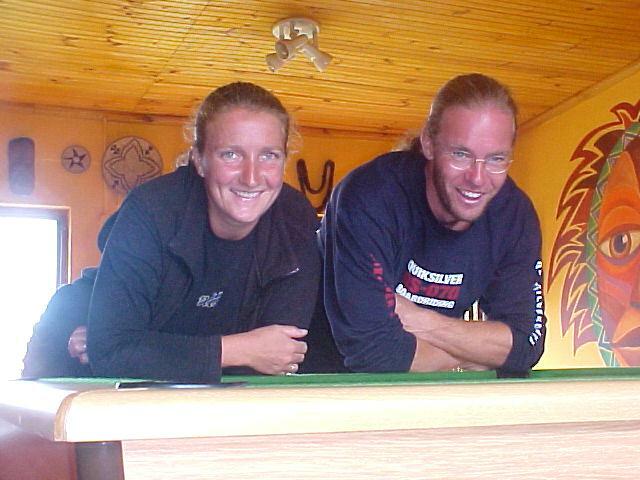 The activity that makes Albergo Backpackers different from any other lodge is that Leslie and Mirjam take their guests for a workout at the local gym. Aerobics, fitness and swimming is all possible. But it already sounded tiring to me as I heard about it in their enthusiastic words. 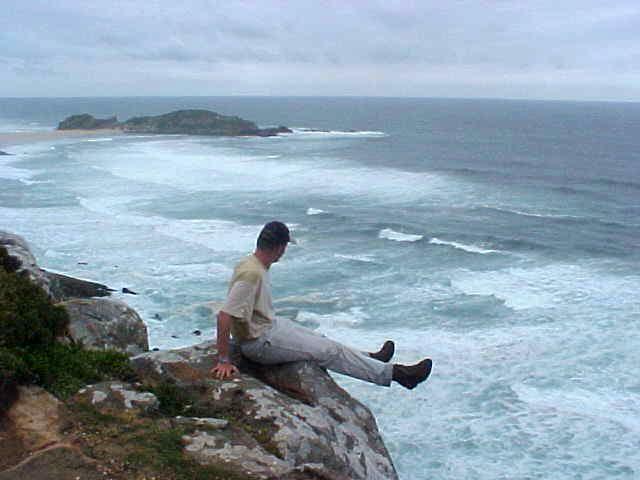 Leslie took me up to the Robberg Peninsula to drop off some German tourist that were going to walk the trail and he showed me some of the most beautiful views on the area. And down in the ocean we could see the dolphins swim around. Back a the lodge I offered to take their two dogs out for a walk, as Mirjam and Leslie were both very occupied. I walked with the 9-months old puppies towards the beach front (well, they more dragged me down there) and spent quite a while walking up and down the beach. The water temperature was perfect, only the weather was too windy to really get in it today. 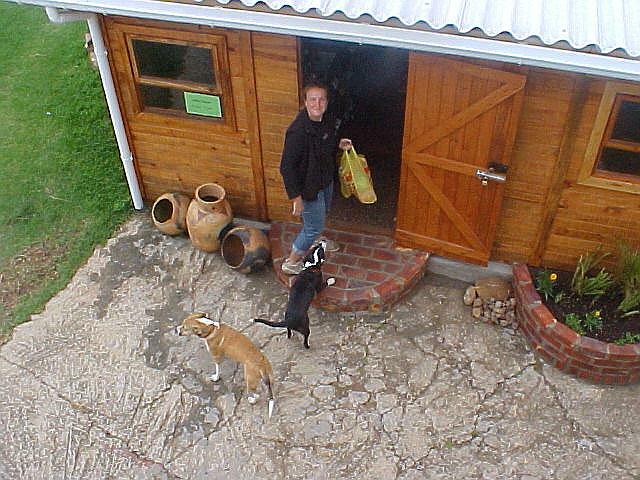 Getting dragged back to the lodge, I really made the day for the dogs. Totally exhausted they lied besides me in the grass. 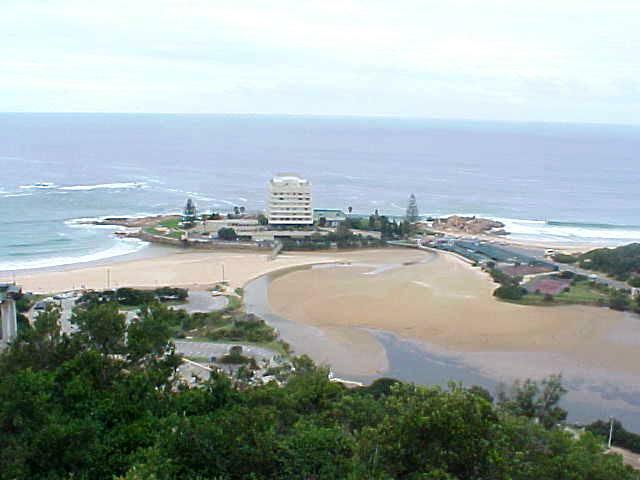 This was already a big exercise to me, as complete Plettenberg is located on a hill next to the sea. The climb up was the worse part of course. I was gently allowed to skip the gym exercises, as I know had a good excuse (hehe!) and I joined three Dutch guests in the outhouse videoroom at the shelter. 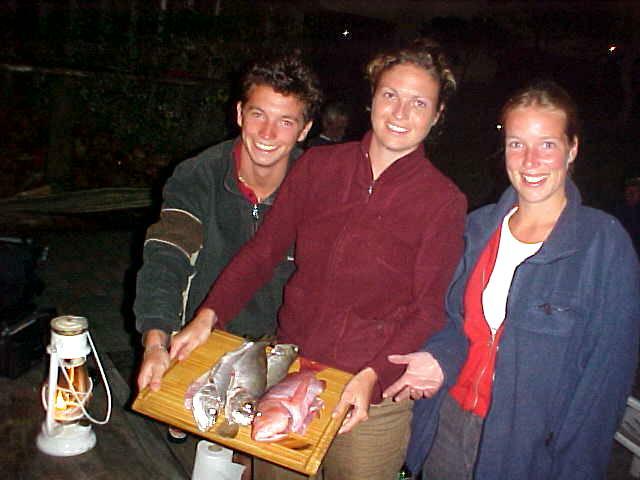 It were the two Dutch girls Annelies and Mieke who were on holiday in South Africa for a few weeks and the Arjen had been stucking on them for the last days as they were the ones with a hired car. They had been deep sea fishing to day and were really wearied and sunburned after their long boat trip and I joined them as they relaxed while watching The Beach on video. 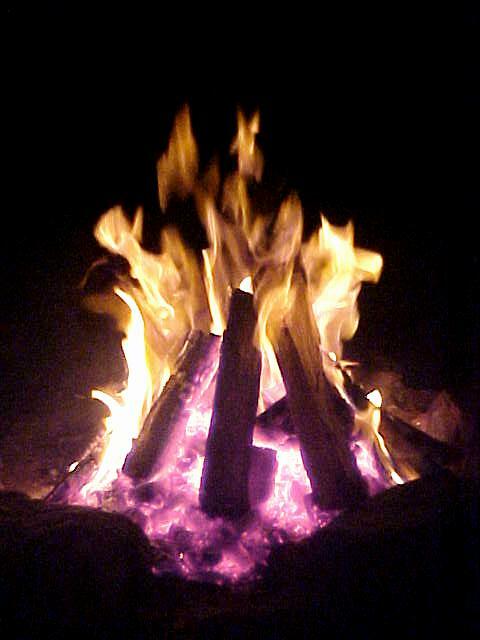 It was around 7pm when the sun had already gone down and the fireplace was already lit. 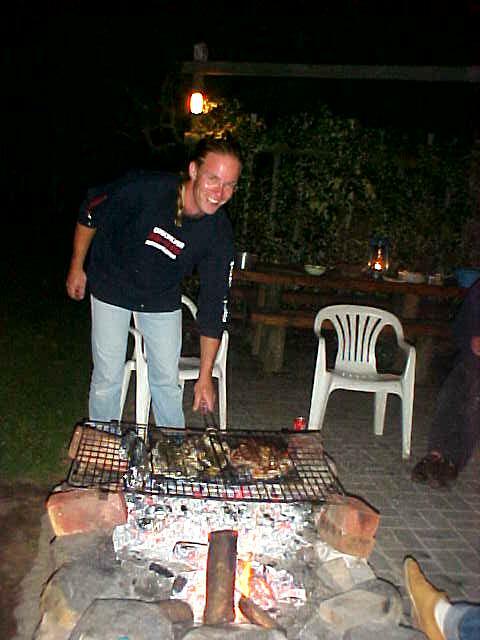 Fortunately the weather permitted us all to have a braai, the South African barbecue. Leslie told me the reason why the Barbecue was called Braai in South Africa. "Because it always rains with a barbecue," and that sounded, how humorous too, a pretty fair explanation. The fish that the Dutch had caught today, was going to be our dinner tonight as Mirjam, Leslie, manager Grace and I joined them. It was interesting to actually know how they caught the fish and to see that fish being put in the oil for a nice final swim to the grill. Just when we had finished dinner and came together around the fireplace, it started raining again. A rain where we just had to grab our belongings together and run to the entrance of the garden house. Here the night basically ended while we drank wine and they made fun of my 'freeloading around the world', because the charming two ladies were really knocked out by the fact that I travel totally for free and everything would be offered to me. And everything I have with me, is sponsored. So of course I became the victim of ironic jokes and we had quite some laughs. 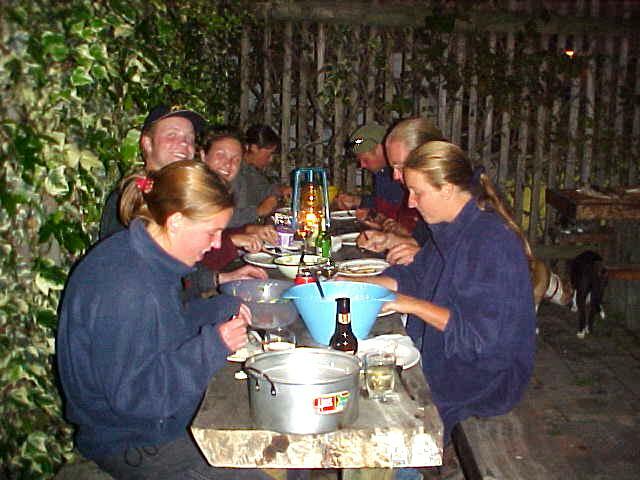 When the wines were finished, we all headed to our beds in the dorm. What a pity that everybody was too tired for a pillow fight� I just fell asleep with my pillow in my hand - darn! Even on my own dorm bed!